A few weeks ago, Que Bella Beauty contacted me to review their products and being the skincare junkie I am, I said yes! I’ve seen a few of Que Bella Beauty’s products around the net but have never tried them out until i received these beauties in the mail. Based in the beautiful English county of Lancashire, nestled in between the natural wonders of The Lake District and The Yorkshire Dales, Que Bella uses these enchanting landscapes to fuel our creativity in utilizing nature’s beautiful gifts, to create the most gorgeous body-care products for you. Our aim is to share these gifts with you. All of our ‘spa at home’ solutions are enriched with natural ingredients, we strive to ensure all our products achieve a result of being at least 80% natural. From Lavender to Roses, Cucumbers to Goji Berries, we believe in using the beauty of nature to deliver its naturally occurring, soothing, revitalizing and refreshing qualities to help cleanse your body and mind. Que Bella is against cruelty to animals. It is our goal to be as transparent and honest with our customers as possible. We believe the “cruelty free” certifications provide unclear explanations to consumers, as it implies that none of the ingredients incorporated into products have ever been tested on animals. This is a nearly impossible certification for any cosmetic company to make. We prefer to be able to stand 100% behind our claims. Que Bella Beauty‘s products can be bought in Target and some (not all) of their products can be found on Target’s website! I appreciate how their products aren’t crazy pricey! Let’s dig into the products! The Que Bella Cherry and Apricot Exfoliating Cleanser polishes to remove makeup, dead skin cells and impurities to reveal the fresh, glowing skin below. Your skin is left feeling renewed and revitalized and perfectly prepared to enjoy a gorgeous Que Bella face mask. As your Perfect Pampering Partner, this is no normal exfoliating cleanser. It has been formulated specifically to prepare your skin to get the most out of your face mask experience. This treatment takes the natural exfoliants derived from the Cherry kernel and Apricot kernel and combines them with Vitamin E, well known for its antioxidant properties. Vitamin E also has a reputation for helping heal scars and scar tissues and preventing damage to the skin from free radicals. This exfoliator lasted me about two weeks and I found that it was more gentle compared to others I’ve used but it still got the job done. I love that it has vitamin E in it and I think I’d purchase this in the future – it’s the perfect size to take for travelling! 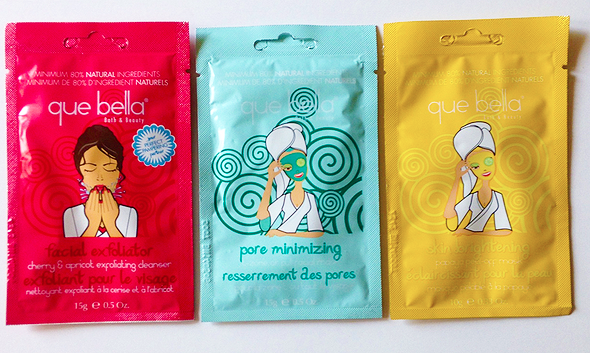 The Que Bella Pore Minimizing Mask can be used as a full facial mask or targeted T-Zone treatment. Enriched with Rosemary and Cottonseed oil’s antioxidant qualities, this works alongside the cleansing and clarifying properties of Nettle extract to soothe sensitive skin, while the Camphor Extracts boosts the circulatory system. Iris Extract, Vitamin A and Zinc Salt soothe and rebalance your skin, leaving a refreshed, smooth sensation. I don’t purchase pore minimizing masks often since the ones I’ve used in the past didn’t seem to do much for me. I used this product once around my T-Zone and it felt nice but I didn’t see much of a difference. I still have some product left so I’ll be sure to update you all once I use it up! The Papaya extract used in this mask is rich in Papain, a powerful digestive enzyme that can help to gently exfoliate the skin. ‘Wonderlight’ is the natural skin radiance active derived from hops that help decrease hyperpigmentation accentuated by age and stress, to equalise skin pigmentation and present a radiant complexion. Peel off masks are so much fun! I enjoyed using this and might purchase it the next time I visit Target. It left my face with a healthy glow and I like the fact that it evens out your skin tone. Like the exfoliator, I think this would be a fun product to take when travelling! I don’t see all of these products on Target’s website but from what I can see, each of these cost around $2.00 give or take a few cents. 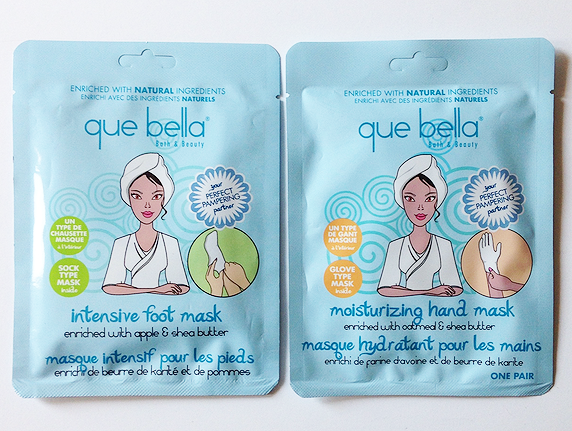 The Que Bella Intensive Foot Mask is an intense moisture treatment that helps to smooth and soften dry, cracked heels and feet. Enriched with Apple and Shea Butter, this sock style foot mask penetrates skin quickly and deeply to protect, nourish and moisturize the skin. After just one use, you will notice improved skin tone and texture and your feet will look amazing. I was really curious about this product..I’ve never seen or used anything like it. They were like socks with product inside and although they did the job..I don’t think I’d ever repurchase these. I have a thing about feet..I think they’re gross so this whole concept wasn’t fun for me but it did moisturize my feet well and my skin did look like it improved in texture! So just to be clear, I do recommend this product – it works well and made a positive difference! I’ll probably pick a couple up for my mom since she might like this sort of thing. 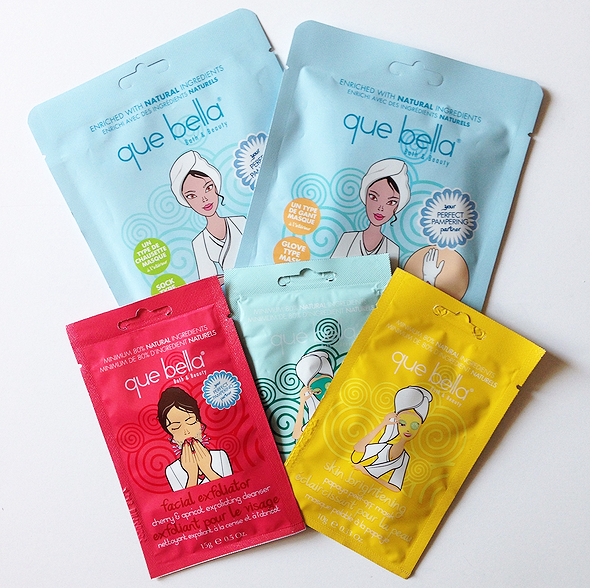 The Que Bella Moisturizing Hand Mask is an intense hydrating treatment that nourishes and restores suppleness to hands. Enriched with Oatmeal and Shea Butter, this glove style hand mask penetrates skin quickly and deeply to protect and moisturize your skin. After just one use, you will notice improved skin tone and texture and your hands will feel amazing. 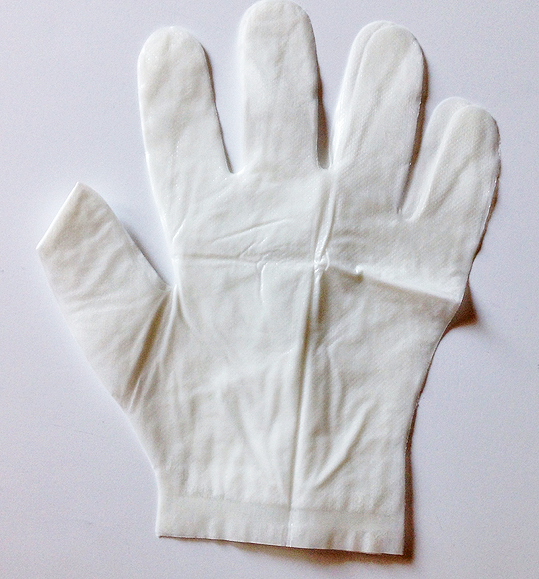 These were like ordinary gloves and it moisturized my skin well! I would probably use this type of hand mask for days I really want to pamper myself. I didn’t see either the hand or foot masks on Target’s website so I can’t tell you all the price but I’m sure it’s affordable as are the rest of Que Bella Beauty‘s products! I really do like Que Bella Beauty‘s products from what I’ve tried! I didn’t expect all of them to work for me so I wasn’t disappointed or anything. I usually don’t like foil packets for exfoliators and masks but the design on each package is so cute! It would be super cool to see some of their products in Birchbox or Ipsy! I’m definitely going to hit up Target soon because I do want to try out their Purifying Tea Tree & Witch Hazel Mud Mask, Clarifying Cucumber Peel-off Mask, and Deep Cleansing Aloe Vera Cream Mask! What are your thoughts on Que Bella Beauty? Let me know if you’ve tried their products or plan to in the future! *I received this item in exchange for my honest, unbiased opinion. All opinions expressed are my own and I would not promote an item if I did not think it would spark interest to my readers. Thanks so much for your comment Ana! They have great options, I'm curious to try all the other ones they have! Those foot masks sound brilliant! Such a good idea! Yes, they're something I've never seen before! ooh cherry and apricot sounds lovely! My pleasure, they were super fun to try out! Ohmygoodness, you def need to check it out then aha! 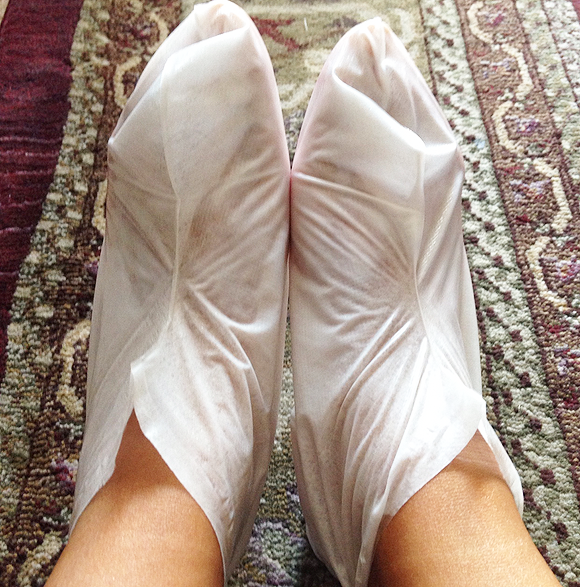 Huh, I may have to give this foot mask a try until I can get a hold of the Tony Moly super peel thing. Let me know how you like it if you try this foot mask out! Thank you for the comment Kate! I'd love to know your thoughts on the exfoliator if you try it out! 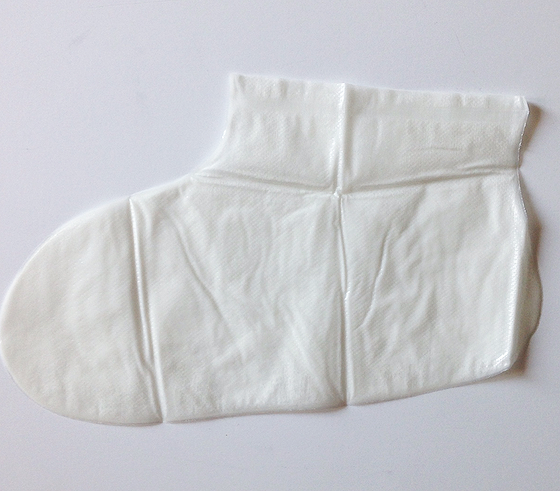 The socks look a bit crazy – I've tried something similar that was an exfoliator for feet and it was amazing. Thank you for your comment Colette! I agree, the socks were a bit out of my comfort zone! When I brought the foot mask, I couldn't open the actual foot mask thing. Like do you rip the top off? Please help. Hi lovely! I had the same issue at first, the mask should have a slight opening and then you'll notice it's sealed – you have to rip that apart like opening a ziploc bag! It might be a little tough so don't worry if you feel like you're about to rip it! I'm such a sucker for masks. I want to try the pore minimizer and brightening masks! I am as well, let me know if you ever try them, I'd love to hear about your experience! I used the anti-aging mask with goji berries and my face broke,out in a full facial rash. It itches like crazy. Not sure what to do. I'm so sorry to hear this, are you allergic to any of the ingredients? I would say to wash your face with cold water and use an ice pack along with aloe vera gel to help sooth it.